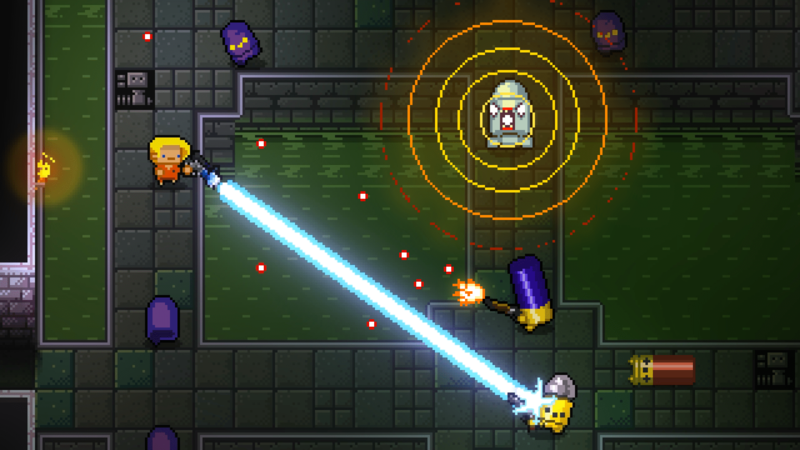 All I really knew about Enter the Gungeon prior to PAX Prime was that it was a twin stick shooter and it had a silly pun of a name. What I didn’t know was how silly it truly was. It takes a special kind of silly to focus an entire game around the pursuit of a gun that kills the past. Not that these are complaints, mind you. Just making sure you have a grasp of what you’re getting into with this delightfully crazy game by Devolver Digital and Dodge Roll. The game takes the gun theme seriously, too. Everything from the bullet shaped enemies to the gun chamber shaped teleportation… chambers hearkens back to the main theme. No, I don’t know how a bullet man would exist, but they are adorable until they start shooting at you. Yes, the bullets also have guns. See what I mean? However, let me be clear. 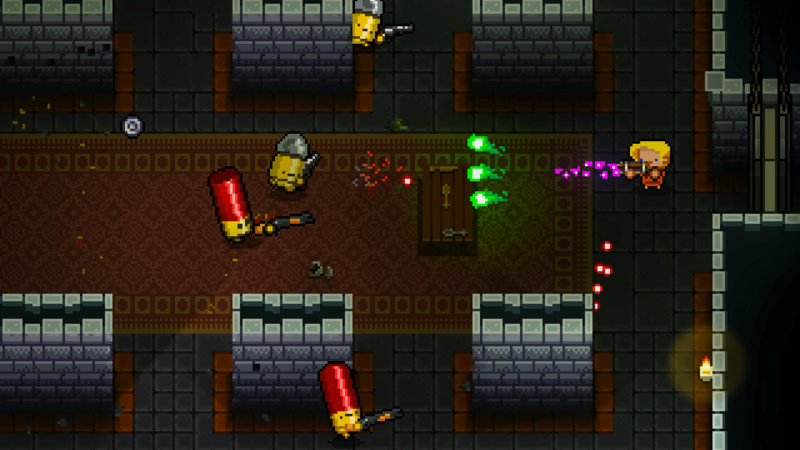 After hundreds of hours of playing games like The Binding of Isaac: Rebirth and Geometry Wars 3, I love me some twin stick action, and Enter the Gungeon does not disappoint. Besides being a twin stick, the game is also a roguelike, so no two playthroughs are the same. Each level is further different thematically. 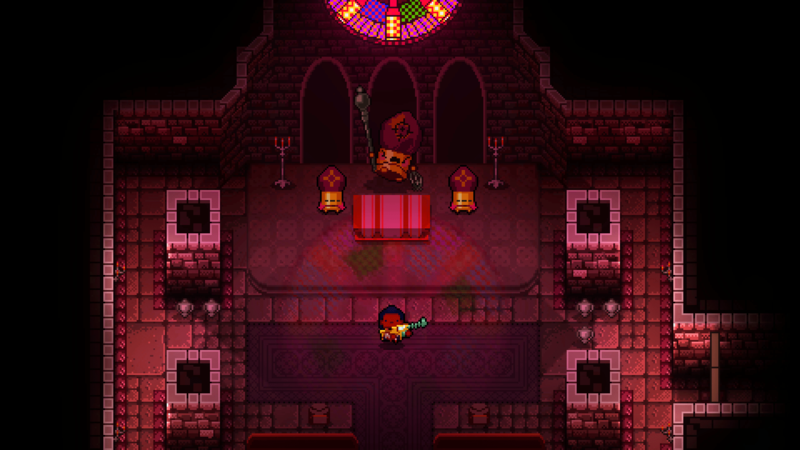 The first stage was a typical gloomy dungeon, but the second was full of fire traps and spikes a plenty. Your only recourse is to fire your gun, flip tables to block bullets, buy items and roll around like crazy, which gives you temporary invincibility. You can also play co-op with a friend, or in my case total stranger. It was a good thing I had a helping hand, because my first playthrough was an utter disappointment. I died a lot, for no good reason other than my incompetence. Second time around I had a much firmer grasp of the controls and physics, and was able to put down the first boss, the insane, Gatling gun wielding Gatling Gull. Think Rambo cross bred with a bird and you are pretty close. No I didn’t fight the Bullet Pope. Yes, I wish I had. 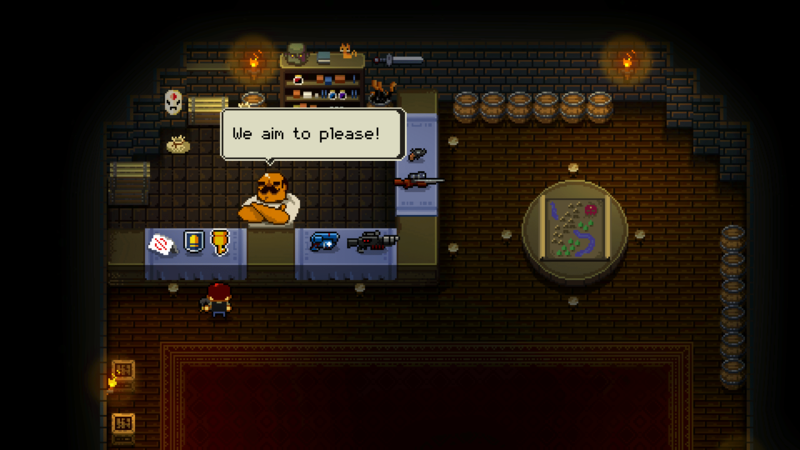 All in all, I enjoyed my time with Enter the Gungeon. It was hard as nails, cartoony and very fun. I can imagine spending tons of hours glued to my screen. For those interested, it will be launching for Steam and PS4 sometime in the future. If you want to see first-hand exactly how crazy this game is, check out the link below.